Poundon House, Bicester OX27 9BB | Friday 21st to Sunday 23rd September 2018. A very special collaboration with the magical &Sister. Join us in the beautiful surroundings of Poundon House in Oxford for a long weekend of deeply healing nature-based practices, delicious food and Yoga. 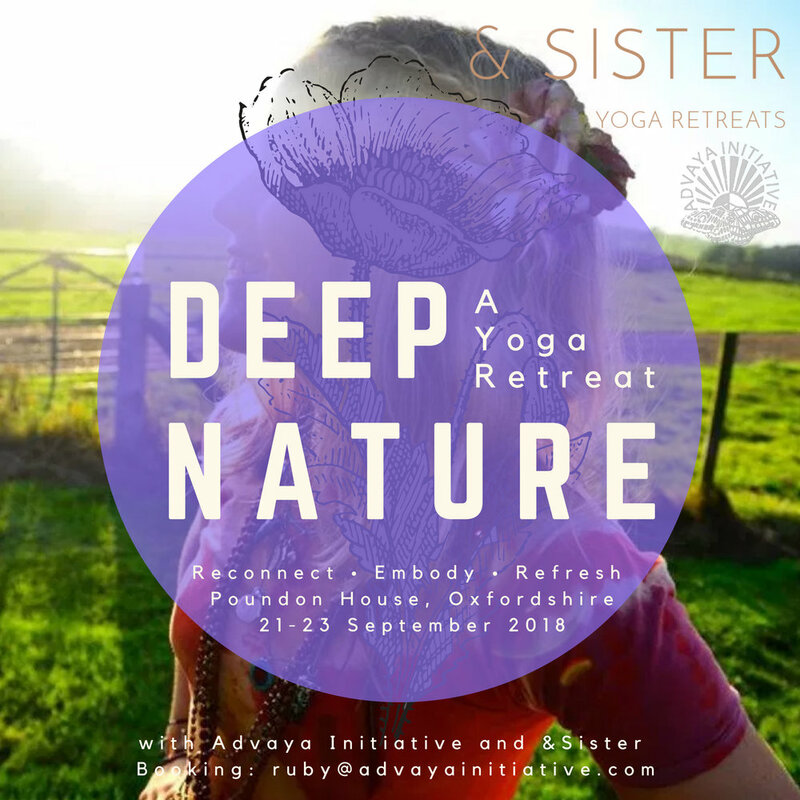 Immerse yourself in your practice and be supported by Alicia Roscoe from &Sister and Ruby Reed from Advaya Initiative as we celebrate the Autumn Equinox and the movement towards the next stage of the year. Two yoga classes will be taught each day by Alicia Roscoe, Yoga teacher and co-founder of &Sister Retreats, and Ruby Reed, co-founder of Advaya Initiative. These classes will be open to all levels. While building strength and flexibility over the 3 days, we will prioritise the development of breath and incorporate elements of movement, chanting, pranayama and meditation. Delicious and healthy breakfasts, lunch & dinners will be cooked and prepared by our talented and healing chefs Atty and Bea. Recipes will be inspired by balancing Ayurvedic traditions using locally sources and organic ingredients wherever possible. We will lead walks in the magical surroundings each day, and host optional nature workshops, from sit-spots to deep awareness practices that connect us deeply with the natural world. We will set up an art station too, and throughout the weekend we invite you to paint, draw and read, engaging with your natural creativity whenever you can. There will of course be plenty of opportunity to relax in our beautiful and luxurious home and it's gardens and take all the time you need to rest for the most important thing of all, your self-care. All-inclusive prices range from £395-425 for shared accommodation. Single occupancy is £550, or en suite single occupancy £595. Camping is £295. To reserve a place and choose your room please contact us. We will then ask you to pay a £200 deposit before paying the full price by mid August. Poundon House has been owned and loved by the Roscoe family for nearly 40 years. Natalie & Alicia (&Sister) grew up at Poundon House and now both work for the family events business. As a family and a business they have hosted many events over the years, from sprawling house parties to 300-strong fusion weddings! Their aim is to share the experience of being in a beautiful country house for the weekend, away from the city, surrounded by nature and, in this case immersing yourself in yoga, delicious nourishing food and enhancing your own well-being. 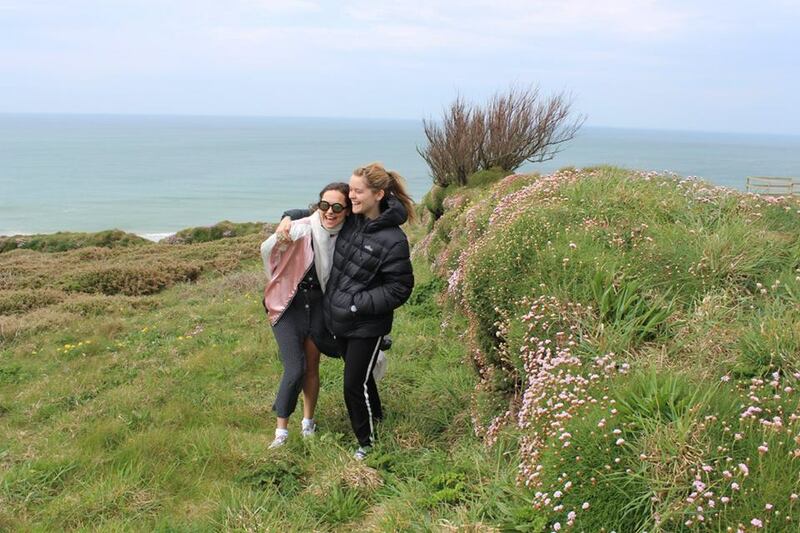 Natalie and Alicia set up the retreat side of Poundon House in August 2015, with the venue quickly becoming a popular destination for retreats and &Sister evolved. Ruby is a yoga teacher, activist and co-founder of the environmental and holistic wellbeing platform Advaya Initiative. She is interested in embodiment and nature connection as sources of healing and empowerment and believes in the power of Yoga to create social change. Ruby is influenced by the progressive approach and breath-led fluidity of the Ashtanga practice, and the energetic attention and adaptability of Viniyoga. Her classes prioritise the breath as a tool for awareness, connection and healing, and integrate strong postures to build energy, resilience and vitality. Ruby works to build community around a renewed sense of awe and wonder in life so that we may connect with our most authentic selves and thrive as we should in harmony with nature. Advaya have hosted over 50 events exploring topics from spiritual activism to plastic pollution, always exploring awareness as the means for evolution to empower individuals to realise their power to create positive change. Ruby is happiest when in water and has spent a lot of time beneath sea level over the years, whether teaching scuba diving in the Andaman Islands or training as a Free-diver. Before becoming a yoga teacher and activist, Ruby worked in the art world at auction houses, with private collectors and galleries. She has an MA with Distinction from the Courtauld Institute, looking at countercultural artistic practices during the dictatorships of South America and Eastern Europe from the death of Stalin to the fall of the Berlin Wall, and another from Edinburgh University looking at ideas around the body and ideal beauty in Renaissance Italy. She was part of the 2014 Teacher Training at Triyoga and is currently completing a 4 year advanced teacher training with Colin Dunsmuir working towards becoming a Yoga Therapist. Poundon House has been owned and loved by the Roscoe family for nearly 40 years. Natalie & Alicia (&Sister) grew up at Poundon House and now both work for the family events business. As a family and a business they have hosted many events over the years, from sprawling house parties to 300-strong fusion weddings! Their aim is to share the experience of being in a beautiful country house for the weekend, away from the city, surrounded by nature and, in this case immersing yourself in yoga, delicious nourishing food and enhancing your own well-being. 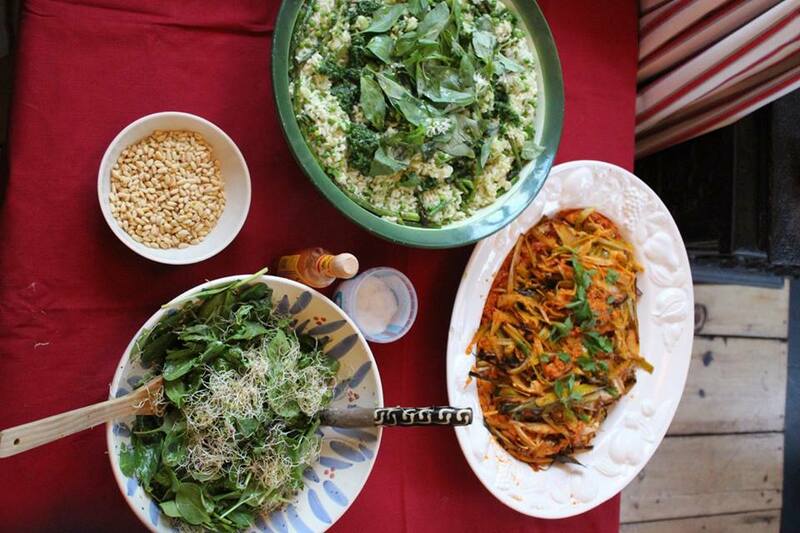 The aim of &Sister is to collaborate with inspirational yoga teachers, chefs with a passion for delicious and healthy food and experienced therapists. Alongside these experts we want to provide not just an escape from the hectic hullaballoo of daily life, but also the chance to return to that life with a renewed vigour and sense of calm and control. As well as on-site wellbeing gurus, you can also expect hands-on hosting. As well as your yoga teacher, Natalie or Alicia will be on site to make sure your stay is blissful. Please feel free to ask us any questions in the lead up and during the weekend, we are more than happy to help with anything; nothing is too big or too small.